If you’re looking to try out a new style or you just like to change things up now and then, the Precision Bass Pickguards from D’Andrea is the perfect way to give your performance a makeover without giving up your favorite guitar. Available in 15 unique designs, you’ll never run out of new looks to try. Each pickguard features vibrant and colorful patters in either sparkle or pearl with a variety of color options. They are precision cut and hand polished with a 4-ply core for a sleek look and durable design. Each one is made with quality materials and delicate care. 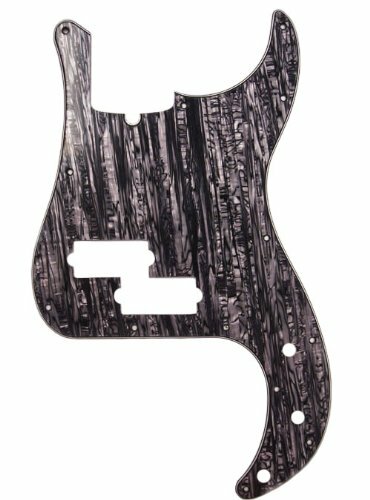 The Precision Bass Pickguards equipped with 13 screw holes to fit the exact specs of actual production models. The excellent fit ensures that you get a perfect and secure fit on your guitar every time, as well as the option to switch between styles as you see fit. Everything you want, all in one. D’Andrea Pro Pickguards fit American, American Standard, American Vintage, Standard and Deluxe series Precision Bass models (fits only the four-string models). Their universal construction make them perfect for all kinds of musicians everywhere. Package contains (1) D’Andrea Precision Bass Pickguards for Electric Guitar. Available in 15 designs. Precision cut, hand polished. 4-Ply core. Features 13 screw holes. Constructed for premium celluloid materials. Made in the USA. KEEP IT FRESH: If you're looking to try out a new style or you just like to change things up now and then, the Precision Bass Pickguards from D'Andrea is the perfect way to give your performance a makeover without giving up your favorite guitar. Available in 15 unique designs, you'll never run out of new looks to try. HIGH QUALITY CONSTRUCTION: Each pickguard features vibrant and colorful patters in either sparkle or pearl with a variety of color options. They are precision cut and hand polished with a 4-ply core for a sleek look and durable design. Each one is made with quality materials and delicate care. SIMPLE SWITCH: The Precision Bass Pickguards equipped with 13 screw holes to fit the exact specs of actual production models. The excellent fit ensures that you get a perfect and secure fit on your guitar every time, as well as the option to switch between styles as you see fit. Everything you want, all in one. FITS YOUR FAVORITE PRECISION BASS: D'Andrea Pro Pickguards fit American, American Standard, American Vintage, Standard and Deluxe series Precision Bass models (fits only the four-string models). Their universal construction make them perfect for all kinds of musicians everywhere. PRODUCT SPECIFICATIONS: Package contains (1) D'Andrea Precision Bass Pickguards for Electric Guitar, Lavender Pearl. Available in 15 designs. Precision cut, hand polished. 4-Ply core. Features 13 screw holes. Constructed for premium celluloid materials. Made in the USA. Manufacturer: D'Andrea USA Div. of Delmar Prod. Inc. Publisher: D'Andrea USA Div. of Delmar Prod. Inc. Studio: D'Andrea USA Div. of Delmar Prod. Inc. If you have any questions about this product by D'Andrea, contact us by completing and submitting the form below. If you are looking for a specif part number, please include it with your message.